On the K.O. 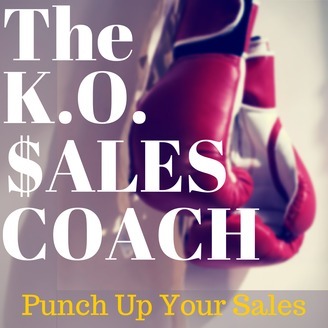 Sales Coach you'll discover proven techniques and strategies to punch up your sales, develop effective selling skills and make stronger connections with your customers. 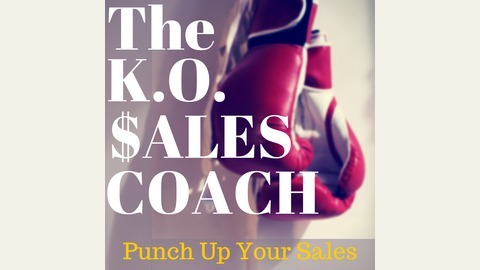 Join us every week for tips to help you, knockout your goals, make more money and advance your sales career. Ever heard someone say "You can do anything you put your mind to?" It's a common phrase and it's really true. So much of your success or failure comes down to what you put your mind to. How is your mindset? Is your inner voice supportive and encouraging or questioning and doubtful? ... and that When you stop limiting your belief in yourself there's no limit to what you can accomplish. How could two salespeople, with the same skills, same amount of experience and opportunity have wildly different results? What could cause such a disparity in sales performance? When a salesperson has doubt or self limiting beliefs it can undermine all of the training and knowledge they have resulting in poor performance. These self-limiting beliefs become a part of your inner dialog and you find yourself engaged in self talk like "I know she's not going to buy, I never close people from the south", "Oh great, they're interested in XYZ and I never sell those". All this doubt and head-trash isn't serving you so it's time to take out the trash and work on building belief in yourself. Self-limiting beliefs are generally not based on anything factual, however you assume they're true. For instance you may hear someone say they aren't a natural born salesperson. This is a self-limiting belief that has no basis in truth. No one is a natural born salesperson. A lot of time training, trial and error and practice go into becoming a successful salesperson and while some people may pick it up faster than others I have yet to see a baby close a deal on a used car. It really is a strange thing and I find it interesting that you don’t hear this about other professions. Can you imagine how crazy it would sound for someone to say "I'm not a natural born fire fighter" ? All of your beliefs influence your behavior and beliefs , of the self limiting kind, tend to influence you in a negative way. They come across in the things you say and do. If you don't feel like you can close a big sales because you're talking to a type of person you've had trouble with before; that doubt will show up in your communication. I've heard salespeople say things like "if you want to get this it would be $300.00. " When you have doubt; words like "IF" creep into your communication and that can cause your customer to have doubts too. You know when you meet a top salesperson by the way the speak and carry themselves. They're confident, they don't wonder if they're going to hit their goal they know they are. Top salespeople don't have self-limiting beliefs and their internal dialog is more positive and supportive. They learned long ago that a key to success is to get rid of the head-trash and trust your abilities. They know they can do whatever they put their mind to. Now you might be saying to yourself: "sounds great but how do I overcome these self-limiting beliefs?" Great question! Sometimes, it's as easy as not believing them anymore. For instance some self-limiting beliefs fall under the "that's just the way things are" category and you allow yourself to be influenced by a collective assumption. You're kind of going along with the crowd but who says they're right? A few years ago I was conducting a training and each person who came in was complaining about the bad day they were having. They would say "it's just the way it is today". Then one of the top salespeople came in and I asked her, how are things going for you so far today? "I'm 0 for 10 right now but I'm going to lunch after this training and when I get back I'm going to turn it around." and she did. While the rest had resigned themselves to "it's just the way it is..." she didn't agree and ended closing the day well over 40%. Now, sometimes it's not as simple as that. Some of your self-limiting beliefs may be deeply ingrained. If so, here's a three step process you can use to get past them. Sometimes it's really hard to get rid of a belief because it's so ingrained. You may have even defined yourself based on it. I’m really bad at math"
"I'm just not good at overcoming objections." You may feel you just weren't born with the ability to be persuasive. It's easy to allow your beliefs to define you but they don't have to. The first step in getting rid of self-limiting beliefs is to stop identifying with them and stop defining yourself by them. The next step is to question your own conclusions. Is it really true that you aren't persuasive? Can you think of other examples in your life when you successfully persuaded someone?Ever convince a friend to see a movie they didn't want to see? Ever talk someone into trying a new food, or restaurant? Chances are you can find examples that contradict your belief and demonstrate that it's not based on fact. This is the most important step in the process. If all you do is identify and question your beliefs you won't actually move past them. You need to take action. This can be tricky because you need to stop listening to negative self talk and reinforce the positive. You've been persuasive before why shouldn't it work in sales? You have the same opportunity as the top salesperson in your company. You sell the same products, use the same tools and resources. The only difference is you. It comes down to what you believe about yourself, your ability and the conversations you have in your head. If you're not where you want to be on the leader-board do a little soul searching, uncover those beliefs that are holding you back and follow the steps we talked about today. When you stop limiting your belief in yourself there's no limit to what you can accomplish.